Andy Thesen’s career in high finance took a dramatic turn the day he initially turned down a college grad seeking employment. 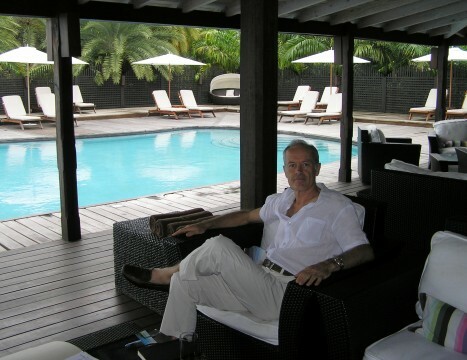 Thesen, the owner of Hermitage Bay in Antigua, believes his accidental path to building a 5-star hotel in the Caribbean had a lot to do with the persistence shown by the young man seeking a foothold in Thesen’s former world of venture capital. “A new college grad repeatedly asked for a position with my former London-based employer, Montagu Private Equity. At first, I didn’t believe he was qualified for our line of work,” Thesen recalled. 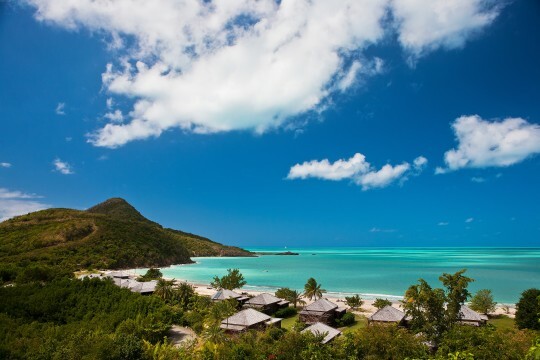 About the same time Thesen was saying “no,” the grad’s father was looking for investors to purchase villas located on a hillside overlooking Hermitage Bay in Antigua. Eventually the grad succeeded in convincing Thesen for an opportunity to work with Montagu. The young man then directed his efforts into persuading Thesen to purchase one of the two-bedroom villas his father was building in the new Antigua real estate development. Thesen remembers cutting short a holiday in Barbados and flying to explore 17-acres of land facing one of Antigua’s most beautiful beachfronts. Thesen and the developer, Andrew Michelin, decided the site was perfect for something bigger and better than mere individual plots for a handful of villas. Impressed with Michelin’s history of building hotels on Antigua, Thesen took the bold step of becoming more than just an investor. “After visiting the site about 10 times between 2002 and 2005, Andrew and I began raising capital for a new hotel. I not only became a co-owner, I physically started clearing our acreage by hand,” Thesen said. In 2005, construction began for Hermitage Bay. Thesen reflected that his experience working in finance would prove little help for his first entrepreneurial venture building and operating a hotel. “At first my wife thought the idea of hotel ownership was exciting. That was before all the hard work opening Hermitage,” Thesen said with a smile. After 18 grueling months building the hotel lobby, restaurant, spa, pool, and villas along a steep hillside, Hermitage Bay opened in time for Christmas, 2006. 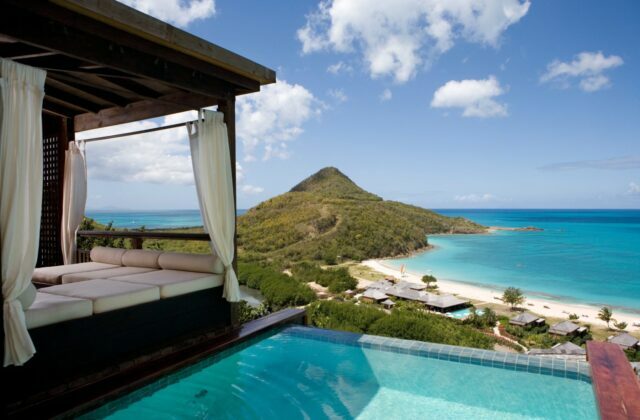 Thesen saw Hermitage as delivering an exceptional two-fold draw for guests seeking the ultimate Caribbean getaway. 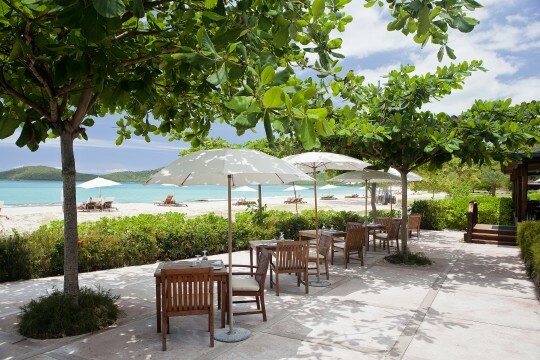 In addition to luxuriating in a quiet and scenic retreat, guests could anticipate a unique oceanfront dining experience. Each day, the Hermitage breakfast, lunch, and dinner menus start anew. The idea of guests savoring gourmet food at every meal is central to the Hermitage Bay mission for differentiating itself from other world-class hotels. Foodies will thrill to the idea that Chef Dezi Banham teaches his insider techniques for cooking Caribbean, American, and international cuisine. Culinary classes are offered to guests interested in picking the brain of Banham, a proponent of the “slow food” tradition emphasizing farm to table cooking. Tours are also offered showcasing Hermitage’s organic garden where a rainbow of fruits and vegetables are handpicked for a guest’s next meal. Thesen stated that he’s come a long away since deciding to make the leap into hotel ownership. Stating that building a hotel “is the hardest work he’s ever done,” Thesen is proud of the team Hermitage has put together and the reputation the hotel has garnered in the luxury hotel niche. Thesen finds his current work to be a full-circle life experience. As a teenager growing up in Bristol, England, Thesen was fascinated with the West Indies community living there, as well as the reggae music of Bob Marley. Yet even with those Caribbean seeds planted early on, Thesen finds it hard to comprehend that he’s now actually living the island life and has a West Indies zip code all his own. The 55-year old Thesen feels a unique satisfaction from the new challenges he takes on daily as a hotel owner. “I find it very rewarding every time a guest says they’ve had a wonderful stay here. I’m also grateful when someone says they love our Hermitage food. Those are times I think about how much better off I am because of this hotel experience,” Thesen said.